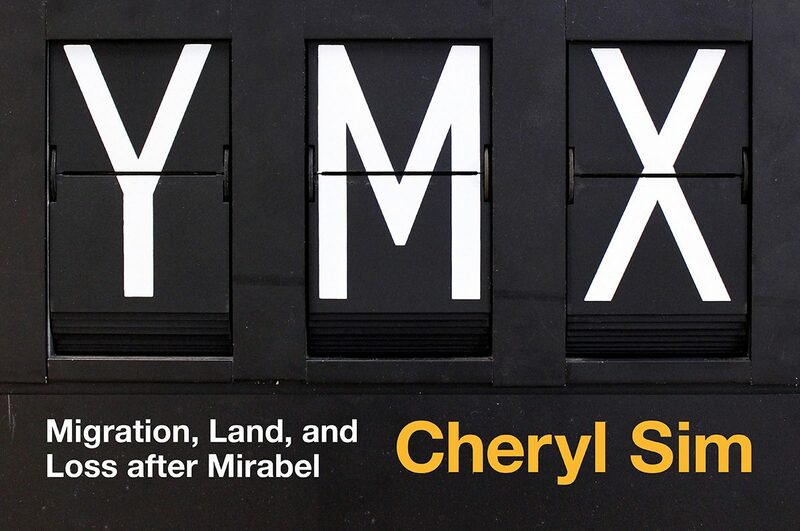 The Montréal Signs Project is excited to announce the opening of the installation YMX: Migration, Land, and Loss after Mirabel by Cheryl Sim. Inspired by the acquisition of two Solari split-flap information displays from Mirabel Airport by Matt Soar, Associate Professor of Communication Studies at Concordia University, Sim’s exhibition speaks to the parallel stories of displacement and forced migration: those dispossessed of their land to build the airport and the thousands of people who arrived at Mirabel escaping war, disaster, or economic adversity. Join us at Galerie POPOP in the Belgo on April 1 for a pack of pretzels, a can of ginger ale, and an individually-sized bottle of wine to celebrate this project. Continuing her immersive installation practice and single-channel video work, Sim enlivens the intersecting narrative lines that run through the airport: of belonging and escape, the force of borders and the perpetuation of colonialism. A labyrinth of crowd control stanchions leads to the memories of Pierre Nepveu, Prem Sooriyakumar, and Kim Thuy: three experiences of Mirabel. Sim’s video work weaves together these voices—both exproprié and refugee—together with archival footage of the airport and the protests that followed its creation. The installation also speaks to the governmental response to the Kanien’kéha:ka of Kanesatake’s claim to the land, whose unresolved petition dates back to 1718, 257 years before the airport opened. At the heart of the maze, the two bright yellow split-flap displays chatter to one another about land and home, resistance and politics, arrival and departure. Sim’s installation digs deep into layers of history to intricately address land, movement, and safety. Cheryl Sim is an artist, researcher and musician as well as Curator/Managing Director at DHC/ART Foundation for Contemporary Art. She is an alumni of Concordia’s MA in Media Studies in the Department of Communication Studies. Presented in North America and Europe, her single channel video and installation work explores identity, women’s work, ethnic clothing and memory through an inter-genre, auto-ethnographic and interdisciplinary approach. As a musician and singer, Cheryl has produced five CDs as a solo artist and with the electronic group Gazelle and now endeavours to bring her music practice into her artwork as much as possible. Stimulated by works across an array of forms and genres, her current curatorial interests include the conditions of diaspora, screen theory, political economy and clothing as a marker of identity. Recent exhibitions include her PhD dissertation project La Cabine d’Essayage/ The Fitting Room (2014) and The Thomas Wang Project presented at OBORO (2015). She is currently working on a new work for the upcoming Expo 67 exhibition at the Musée d’art contemporain de Montréal. Her work is infused with a desire to tell stories through a critical strategy of what she calls “politicized sensuousness” that combines video, music, installation, and performance. ACCESSIBILITY: A wheelchair-accessible entrance with power assist doors is located at the building’s entrance at 372 Sainte-Catherine St. W, between Bleury St. And Saint-Alexandre St. Wheelchair-accessible restrooms are located on all floors except the entry level. Two elevators are located to the right and left of the main stairway on each floor. Metered parking spaces for people with reduced mobility are available at the underground parking of the building, with access to the garage located on Saint-Edward St. between Sainte-Catherine and René-Lévesque. For further information, please contact Danica Evering at 519-994-3869 or danica.evering@gmail.com. CONTACT: Matt Soar, Founding Director, Montréal Signs Project, 514 848 2424 x2542, mattsoar@gmail.com.